At Redlands Lock and Key, we’ve performed locksmith services for thousands of clients all over the Redlands area. Whether you’re in Beaumont, Colton, Highland, Loma Linda, Yucaipa, or any other surrounding regions, we’ll always be just a phone call away for expert locksmithing services. 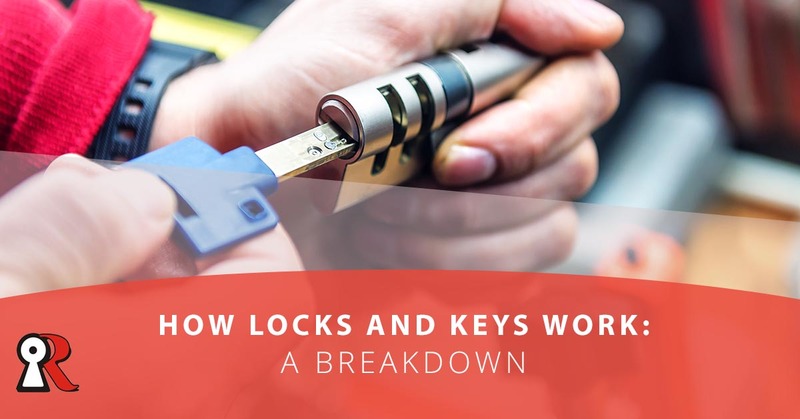 Interestingly enough, among the abundant amount of people we’ve served, there is a surprisingly large amount of people who don’t know how keys actually work. This isn’t too unfathomable — we are surrounded by incredible technology everywhere and we don’t question how a lot of things work — but it can be useful to know what exactly is happening when you put a key into a lock. Let’s take a look at how keys work! While locks vary greatly in complexity, build quality, and craftsmanship, the core principles have been the same for hundreds, if not thousands, of years. Check out this graphic which clearly shows what a key looks like inside of a lock, and refer to it as you read the following paragraphs. In any given lock, there is a part that rotates, which is what happens when you have a key that fits. However, the rotating components are attached to a bigger module, and there are little pins inside that can get in the way of the rotating part (called the cylinder cam). When the cylinder cam is blocked by the little metal pins, it’s unable to fully rotate and that’s what’s happening when a door is locked. However, each of these pins is made up of two pieces, effectively split into two halves. Under the right conditions, it’s possible for them to all line up perfectly so that the partition between the two pieces are all lined up in a line, allowing the cylinder cam to turn. Keys are what allow the pins to line up perfectly, allowing the lock to rotate. Each pin is a different length, and the grooves on the keys press down on them to create a perfectly straight line, allowing the cylinder cam to move. See what would happen if the key were removed? 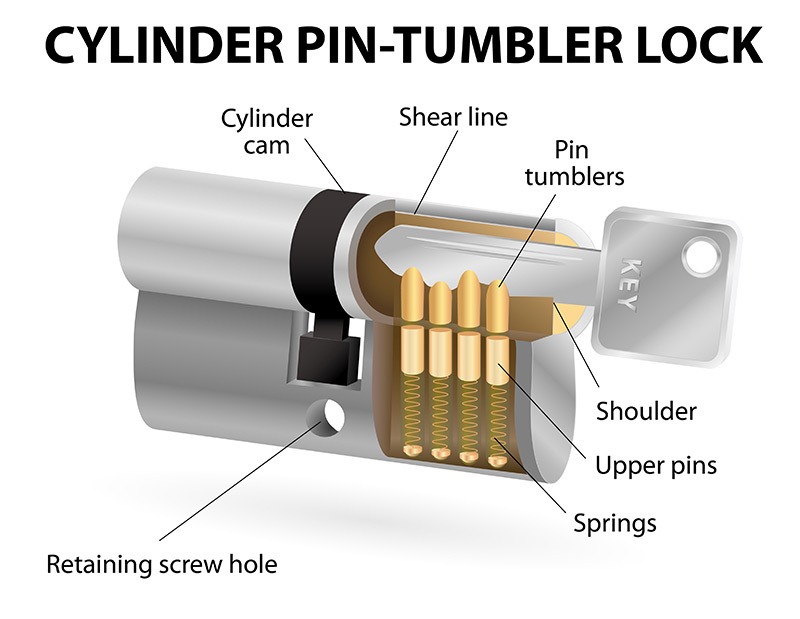 The spring loaded pins would push up, causing them to cause a divide that prevents the cylinder cam from moving. What Causes Keys and Locks to Stop Working? Understanding how keys and locks work can help you understand why they sometimes go bad. Have you ever had a key that becomes unreliable over time? Some keys that have seen heavy use can become worn down, causing their grooves to be at slightly different heights than when they were originally cut. Even the smallest discrepancy can cause a pin to misalign, so having a worn-down key or debris inside the lock can cause either the key or lock to not function as intended. Do you have a broken lock or key? Did you leave your keys behind and you need to get into somewhere important, such as your home or car? Has your car transponder key stopped working for a mysterious reason? These are all reasons to call your nearby local locksmiths. Redlands Lock and Key can provide quality locksmith services. Contact us, and we can quickly arrive at your location to help you in your time of need.